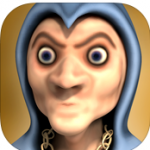 Apps4Review.com | Monster of Puppets : Deads are Alive ! 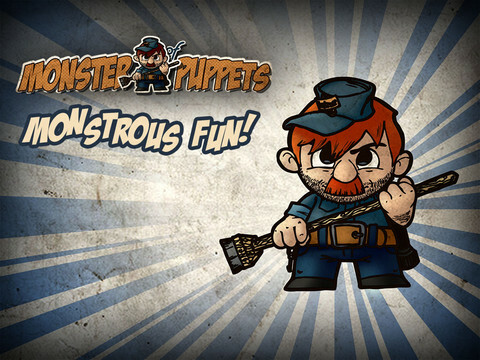 Monster of Puppets : Deads are Alive ! Just take a look at all the non-living things around you. Just imagine if they all go alive for a moment. Surprisingly weird! That’s what it is with your guitar hanging out on the road and striking its own notes. If you are already hooked to the story, let’s divert back to another similar one. Imagine yourself to be a lone janitor in the long night at an amusement park. You are being surrounded by stalls of puppets. You are doing your job nicely and peacefully until a UFO arrives at the spot and emits a beam at the stalls. The source of energy brings the puppets back to life to fight against the humans. Now, it’s your job to save the world from those cute little monsters and play the role of a savior! 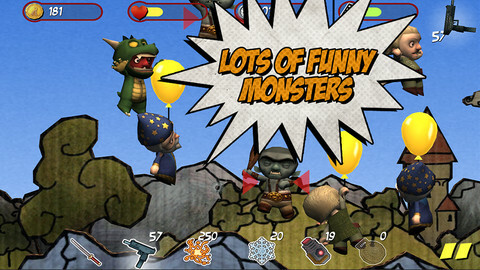 The story belongs to the new iOS app, Monster of Puppets that has been developed by NuOxygen. Being compatible with iPhone, iPod touch and iPad, it has also been optimized for iPhone 5 and requires iOS 5.0 or later version. 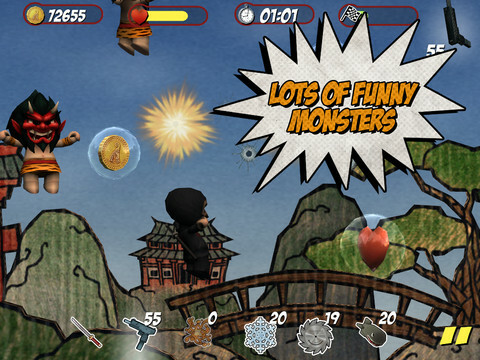 Coming to the basics, the app is a combination of a slashing and shooting, much similar to Fruit Ninja. But the main element that characterizes this app different from others is the “back-attack” ability of the puppets shortens your life. The game play consists of all the puppets bouncing their way. You can use your broom to slash the puppets and tap to shoot them down. There are also many traps to catch the puppets and power ups, in case you get struck by any puppet hardly. 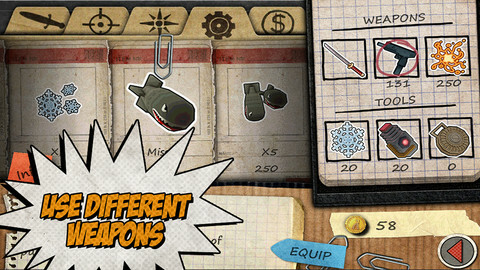 What keep the interest alive are the numerous weapons available to unlock. You can unlock them by collecting coins while taking down your enemies. However, if you’re not fit enough to do that buy some coins via in-app purchase and get all of them in your pocket. With two game modes: story and survival, the developer has soaked enough content in this 70MB game that it’ll take you hours to visit each of the corners. There are unlimited no. of levels indicating unlimited fun and fear. One of the main positives of the app is the Graphics department. It really helps when you feel like if you are fighting for real or when the fantasy world of your dreams comes true. All the characters have been designed with patience and it must have been the most difficult part for the developer. They are cute as well as creepy enough to be considered as monsters. Also help the Halloween kind of alien sounds to make it even better. There are many reasons to love the game. First and foremost, it is available for free in the App Store. The game play is addictive and kind of unique as well. Then there are many weapons and monsters to fear from. The graphics are one of the best we’ve come across by day. Then you got unlimited levels of game play. We don’t think there’s anything next to install it now. But beware of the repetitive game play for an indefinite period of time!